Last night we were able to attend a Steven Curtis Chapman concert in Ocala. He and his wife are the cofounders of Shaohannah's Hope, the organization from which we received our grant. It was a great concert. We were really hoping to be able to thank him personally and maybe get a picture of him holding Anna's picture, but there were a lot of people there and a lot of families who wanted to do the same thing so it didn't happen. It was disappointing but we were grateful to the radio station who gave us the tickets and we had a good time together. One of the things that made it worth the two hour drive was seeing the families who had adopted already. It was refreshing to hear so many positive things about adoption. There are a lot of people who view it negatively. Being the naive person that I am, I didn't have a clue about that until we started getting more involved. It was so nice to be reminded of why we are doing this and to feel that it is a good thing. I really needed that. Steven talked about the fact that, as Christians, we have all been adopted into the family of God and though I've heard it before, it was so powerful to hear him say it the way he did. I have to say, we didn't start this process with totally altruistic motives of saving a child or anything like that. I had those dreams as a girl and then life happened. Our life became about taking care of Emma and Allie. When we realized that having another biological child was not an option for us, we started our journey to adoption. It has been a long one. I guess I view it as something we all need. I mean us and Anna. We knew our family was not complete and she needs a family. We all need each other. Anyway, being at the concert reminded me of that. There are no easy answers in this life. We do the best we can with what God gives us and trust Him to fill in where we fall short. I know we're not perfect by a long shot but we're giving it our all, and if we give a home to a child who needs one we sure are honored to do that. But we need her just as much as she needs us. What a blessing little Anna is going to be to you, and you to her! It feels like our family is incomplete now too. :-( It is too early, but maybe one day the Lord will lead us to walk the same road you are walking now. 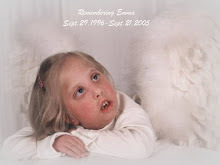 Thank you for emailing me the pictures of Emma's marker, btw. I have not been replying to emails much - just being slack I suppose, but I am honored that you sent them to me.